Download "Educational Psychology and Behaviour Support Service. 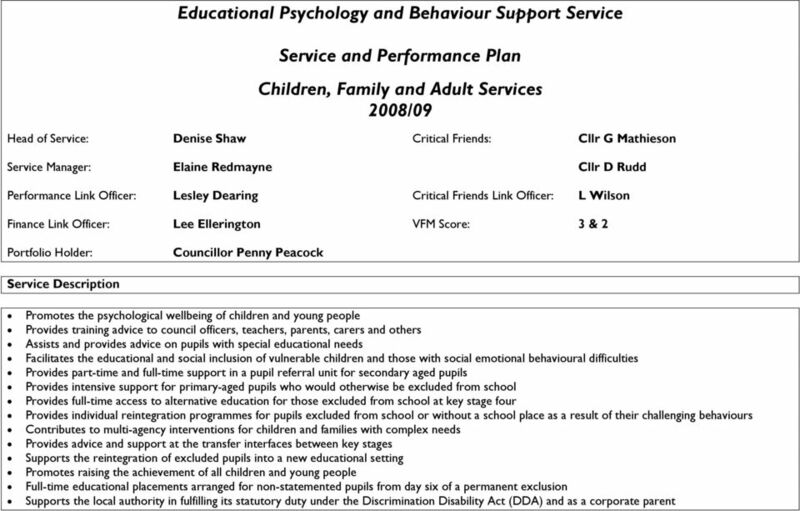 Service and Performance Plan Children, Family and Adult Services 2008/09"
3 1. Looking back to last year 2007/2008 The service has met all service targets in delivery of advice to schools and parents on the social emotional aspects of learning. Up to 14/02/08 (half way through the school year ) 53% of all agreed Advisory Teacher time has been given and 76% of EP sessions. There has been a significant increase in the training given to adults particularly for those working with children on the autistic continuum. Two Early Birds and one Early Birds plus course have been delivered since May 07. The team have also delivered training for St John s York University in conjunction with school improvement. In addition SEAL training has increased as the number of schools following the initiative increases. 94% of statutory advice has been completed within the six week timeframe. The two reports which were submitted after the deadline were due to one team member being absent from work due to illness. Advice was again given to school improvement re the wider aspects of educational standards within the East Riding. The service has continued to improve in helping to ensure that all schools are supporting the inclusion of vulnerable and at risk children. There has been a further decrease in the number of permanent exclusions in the academic year (data available September 07). The number has fallen to 21 permanent exclusions. There are however early indicators that this year s permanent exclusion figures are likely to be higher. This is also a national issue and may be linked to the change in legislation. The SEAL initiative has continued to be rolled out successfully. The DfCSF target of all primary schools using SEAL has not been achieved but this is as a result of a decision to ensure effective, planned roll-out. The team have also been awarded funding to undertake a pilot on Family SEAL with the outcomes being published nationally. Feedback from the National Strategies coordinator has been very complimentary re the East Riding approach to developing SEAL and we are seen as a national leader. SEAL is now being delivered to secondary schools with DCSF targets being met. The Behaviour Support Panel has ensured that behaviour at level 3 (service descriptor) has been met appropriately. All pupils referred to the panel have been discussed within one week (term time only). Further provision has been developed including TNAC key stage 3 Back to School Plus course and the Driffield Key Stage 4 provision. This provides 18 additional placements to support pupils with complex behavioural needs. Work related learning has continued to meet the needs of 152 pupils in arranging, coordinating and monitoring work placements for those students in key stage 4 who are experiencing difficulties in accessing a school based curriculum. Other Developments The service has played a significant role in developing the East Riding parenting initiative. 18 of the EPBST have been trained in delivering Triple P. Three senior EPs act as supervision leads for Triple P and are the first EPs nationally who have done this (usually carried out by Clinical Psychologists). The team have targeted group Triple P and are now developing East Riding s own parenting approach using best practice. Work Related learning have been given additional grant funding to run a mentoring scheme for young people in terms of accessing work etc. Both Pupil referral units have recently had an OFSTED inspection with Hornsea being classed as good and Rawcliffe as satisfactory. b) What principal objectives did you not make progress against in 2007/08? None c) What consultation have you conducted? 4 End of year review in all schools Customer satisfaction survey. Highlighted the need to continue to develop a range of additional part time provision to meet the needs of highly challenging children. Also highlighted areas where some staff would benefit from further support and training. d) What have been your main achievements/key innovations in 2007/08? Meeting all targets and developing SEAL and TRIPLE P initiatives. 2. 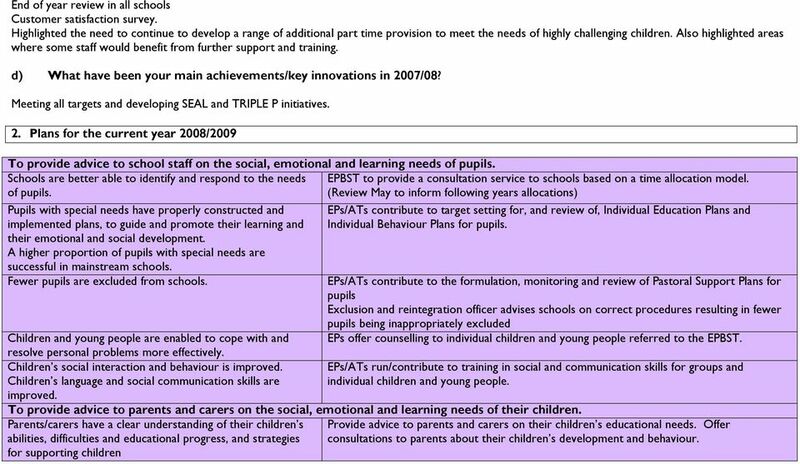 Plans for the current year 2008/2009 To provide advice to school staff on the social, emotional and learning needs of pupils. 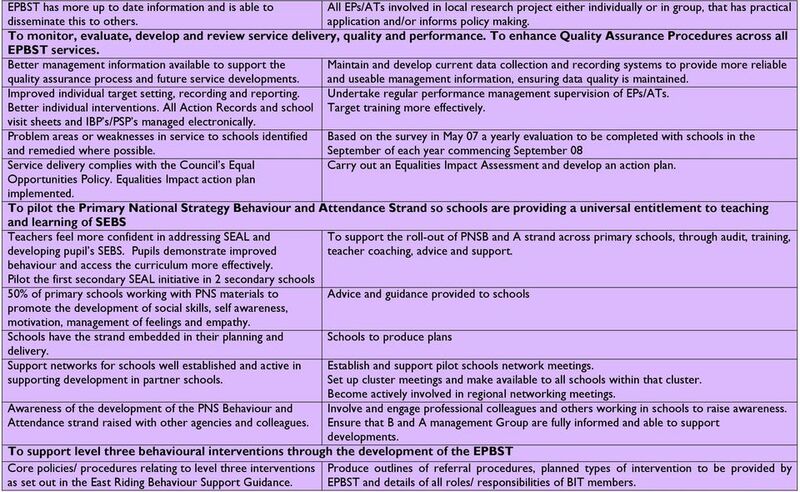 Schools are better able to identify and respond to the needs EPBST to provide a consultation service to schools based on a time allocation model. of pupils. (Review May to inform following years allocations) Pupils with special needs have properly constructed and implemented plans, to guide and promote their learning and their emotional and social development. A higher proportion of pupils with special needs are successful in mainstream schools. Fewer pupils are excluded from schools. 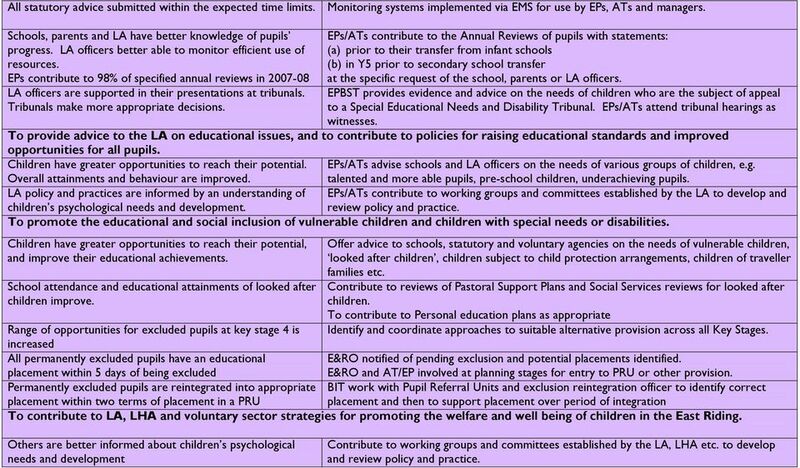 EPs/ATs contribute to target setting for, and review of, Individual Education Plans and Individual Behaviour Plans for pupils. EPs/ATs contribute to the formulation, monitoring and review of Pastoral Support Plans for pupils Exclusion and reintegration officer advises schools on correct procedures resulting in fewer pupils being inappropriately excluded EPs offer counselling to individual children and young people referred to the EPBST. Children and young people are enabled to cope with and resolve personal problems more effectively. Children s social interaction and behaviour is improved. Children s language and social communication skills are improved. To provide advice to parents and carers on the social, emotional and learning needs of their children. Parents/carers have a clear understanding of their children s abilities, difficulties and educational progress, and strategies for supporting children EPs/ATs run/contribute to training in social and communication skills for groups and individual children and young people. Provide advice to parents and carers on their children s educational needs. Offer consultations to parents about their children s development and behaviour. 5 Schools able to offer courses for parents, reflecting parental needs and priorities. More parents have access to information and training. Parents/carers have a better understanding of their children s emotional, social and educational needs. Parents/carers understand statutory procedures relating to SEN and exclusions Others have a clearer understanding of the views and feelings of parents/carers, and take these into account in their decisions and actions. Children involved as far as possible in decisions about their future. Preventative Work undertaken with excellence cluster year 7 Promote the current programme of courses for parents, in consultation with schools. Provide information to parents about LA systems, procedures, and statutory rights and duties. EPs/ATs ascertain the views and feelings of parents/carers about their children s needs and represent these to teachers, other agencies, Council officers etc. Parenting Groups to be offered to all parents of year 7 pupils in excellence cluster secondary parents through triple P initiative. schools. Review of process to set further actions. Individual parents to improve parenting skills where child is HSLWs to deliver 10 triple P parenting courses. presenting significant behavioural difficulties. OSOs to deliver 5 triple P parenting course. EP/AT to deliver triple P as appropriate To provide training for adults who work with or care for children and young people. Participants have raised awareness and improved knowledge EPBST runs training courses for schools and for groups of teachers (e.g. SENCOs). & understanding of issues relating to children with special EPBST contributes to training for Teaching Assistants and other ancillary school staff. educational needs. EPBST undertakes training of school staff as part of the Primary National Strategy Behaviour Participants are better equipped to solve problems without & Attendance Pilot and KS3 Strategy additional resources or expensive specialist services. Participants are able to disseminate knowledge and good practice to others. Governors are better informed about educational and statutory issues relating to pupils with SEN, and their own responsibilities in this area. EPBST runs / contributes to courses for other professional groups and voluntary organisations. EPBST runs /contributes to training for school governors on developments in statutory framework on SEN, disability discrimination etc. Support for KS3 Behaviour & Attendance Strategy is better Develop links and protocols with KS3 Behaviour & Attendance Strategy Consultant coordinated. Service and staff resources for delivery of training to schools Review Training Business Plan income generation targets, and use of income to support CPD are enhanced. for EPBST staff. 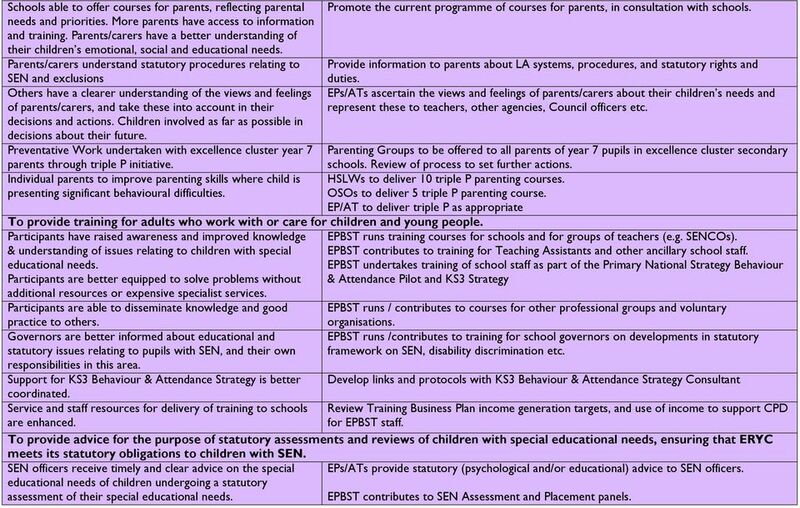 To provide advice for the purpose of statutory assessments and reviews of children with special educational needs, ensuring that ERYC meets its statutory obligations to children with SEN. SEN officers receive timely and clear advice on the special EPs/ATs provide statutory (psychological and/or educational) advice to SEN officers. educational needs of children undergoing a statutory assessment of their special educational needs. EPBST contributes to SEN Assessment and Placement panels. 6 All statutory advice submitted within the expected time limits. Monitoring systems implemented via EMS for use by EPs, ATs and managers. Schools, parents and LA have better knowledge of pupils progress. LA officers better able to monitor efficient use of resources. EPs contribute to 98% of specified annual reviews in LA officers are supported in their presentations at tribunals. Tribunals make more appropriate decisions. EPs/ATs contribute to the Annual Reviews of pupils with statements: (a) prior to their transfer from infant schools (b) in Y5 prior to secondary school transfer at the specific request of the school, parents or LA officers. EPBST provides evidence and advice on the needs of children who are the subject of appeal to a Special Educational Needs and Disability Tribunal. EPs/ATs attend tribunal hearings as witnesses. To provide advice to the LA on educational issues, and to contribute to policies for raising educational standards and improved opportunities for all pupils. Children have greater opportunities to reach their potential. EPs/ATs advise schools and LA officers on the needs of various groups of children, e.g. Overall attainments and behaviour are improved. talented and more able pupils, pre-school children, underachieving pupils. LA policy and practices are informed by an understanding of children s psychological needs and development. To promote the educational and social inclusion of vulnerable children and children with special needs or disabilities. Children have greater opportunities to reach their potential, and improve their educational achievements. School attendance and educational attainments of looked after children improve. EPs/ATs contribute to working groups and committees established by the LA to develop and review policy and practice. Offer advice to schools, statutory and voluntary agencies on the needs of vulnerable children, looked after children, children subject to child protection arrangements, children of traveller families etc. Contribute to reviews of Pastoral Support Plans and Social Services reviews for looked after children. To contribute to Personal education plans as appropriate Identify and coordinate approaches to suitable alternative provision across all Key Stages. Range of opportunities for excluded pupils at key stage 4 is increased All permanently excluded pupils have an educational E&RO notified of pending exclusion and potential placements identified. placement within 5 days of being excluded E&RO and AT/EP involved at planning stages for entry to PRU or other provision. Permanently excluded pupils are reintegrated into appropriate BIT work with Pupil Referral Units and exclusion reintegration officer to identify correct placement within two terms of placement in a PRU placement and then to support placement over period of integration To contribute to LA, LHA and voluntary sector strategies for promoting the welfare and well being of children in the East Riding. Others are better informed about children s psychological needs and development Contribute to working groups and committees established by the LA, LHA etc. to develop and review policy and practice. 7 LA officers have better knowledge of the educational needs of children with ASD at pre-school and school age, and the ways in which provision might be improved, developed and coordinated. Contribute to and coordinate a wider consultation groups to assess the educational needs of, and provision for, children with autistic spectrum disorders in the Authority. To participate in and contribute to multi-agency and multi-disciplinary work with children and families. CT Management Board is better informed. EPBST has clearer view of its potential role and contribution. EPs/ATs more aware of, and coordinate their own work with that of other agencies and professionals. Others have a better understanding of the educational and psychological needs of their clients, and the skills and expertise of EPs/ATs. The social and psychological difficulties of children and families are more quickly and effectively addressed through joined-up working. Other agencies within the East Riding receive support from specialist senior EP for LAC EPBST actively contributes to the work of family support teams. Children with more severe needs, and children at risk, are identified sooner and measures to support or protect them are implemented more quickly. EPBST contributes to setting up and development of Multi-Agency Family Support Teams through the CT Management Board. Provide consultancy service to and contribute to casework for children and families referred to FSTs, Social Service, Health Service professionals, and to voluntary agencies. 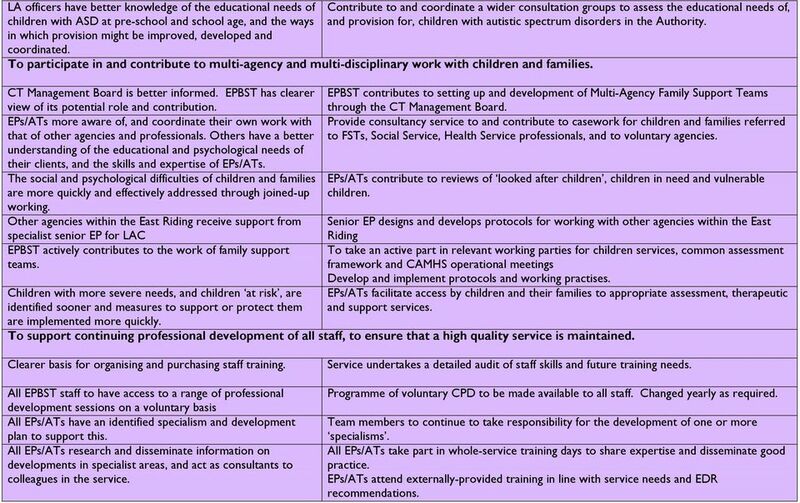 EPs/ATs contribute to reviews of looked after children, children in need and vulnerable children. Senior EP designs and develops protocols for working with other agencies within the East Riding To take an active part in relevant working parties for children services, common assessment framework and CAMHS operational meetings Develop and implement protocols and working practises. EPs/ATs facilitate access by children and their families to appropriate assessment, therapeutic and support services. To support continuing professional development of all staff, to ensure that a high quality service is maintained. Clearer basis for organising and purchasing staff training. All EPBST staff to have access to a range of professional development sessions on a voluntary basis All EPs/ATs have an identified specialism and development plan to support this. All EPs/ATs research and disseminate information on developments in specialist areas, and act as consultants to colleagues in the service. Service undertakes a detailed audit of staff skills and future training needs. Programme of voluntary CPD to be made available to all staff. Changed yearly as required. Team members to continue to take responsibility for the development of one or more specialisms. All EPs/ATs take part in whole-service training days to share expertise and disseminate good practice. EPs/ATs attend externally-provided training in line with service needs and EDR recommendations. 8 EPBST has more up to date information and is able to All EPs/ATs involved in local research project either individually or in group, that has practical disseminate this to others. application and/or informs policy making. To monitor, evaluate, develop and review service delivery, quality and performance. To enhance Quality Assurance Procedures across all EPBST services. Better management information available to support the Maintain and develop current data collection and recording systems to provide more reliable quality assurance process and future service developments. and useable management information, ensuring data quality is maintained. Improved individual target setting, recording and reporting. Undertake regular performance management supervision of EPs/ATs. Better individual interventions. All Action Records and school Target training more effectively. visit sheets and IBP s/psp s managed electronically. Problem areas or weaknesses in service to schools identified Based on the survey in May 07 a yearly evaluation to be completed with schools in the and remedied where possible. Service delivery complies with the Council s Equal Opportunities Policy. Equalities Impact action plan implemented. September of each year commencing September 08 Carry out an Equalities Impact Assessment and develop an action plan. To pilot the Primary National Strategy Behaviour and Attendance Strand so schools are providing a universal entitlement to teaching and learning of SEBS Teachers feel more confident in addressing SEAL and To support the roll-out of PNSB and A strand across primary schools, through audit, training, developing pupil s SEBS. Pupils demonstrate improved teacher coaching, advice and support. behaviour and access the curriculum more effectively. Pilot the first secondary SEAL initiative in 2 secondary schools 50% of primary schools working with PNS materials to promote the development of social skills, self awareness, motivation, management of feelings and empathy. Schools have the strand embedded in their planning and delivery. Support networks for schools well established and active in supporting development in partner schools. Awareness of the development of the PNS Behaviour and Attendance strand raised with other agencies and colleagues. Advice and guidance provided to schools Schools to produce plans To support level three behavioural interventions through the development of the EPBST Core policies/ procedures relating to level three interventions as set out in the East Riding Behaviour Support Guidance. Establish and support pilot schools network meetings. Set up cluster meetings and make available to all schools within that cluster. Become actively involved in regional networking meetings. Involve and engage professional colleagues and others working in schools to raise awareness. Ensure that B and A management Group are fully informed and able to support developments. 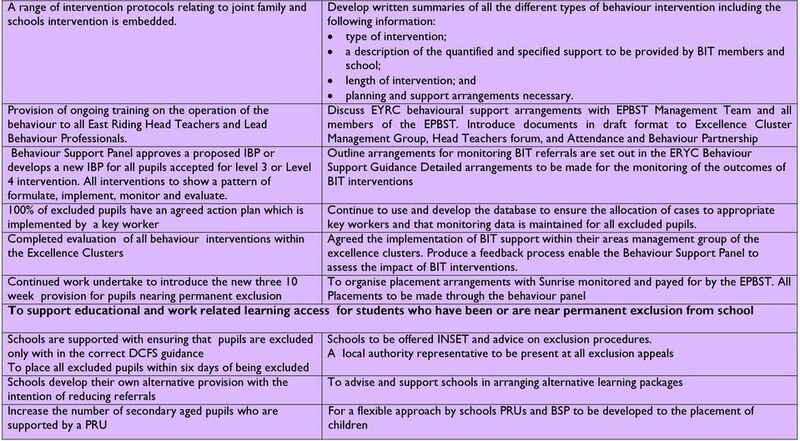 Produce outlines of referral procedures, planned types of intervention to be provided by EPBST and details of all roles/ responsibilities of BIT members. This report outlines a proposal to enable a chargeable element to be introduced to the West Sussex Educational Psychology Service. IASW Submission to TUSLA Corporate Plan September 2014. 1. How will you judge the success of TUSLA in three years time?